those are good conservative settings i think. for track use id use a little toe out in front (like -.125 to -.25 total) plus less rear toe-in (like .125 or even try 0) as much front negative camber as you can get (even if it means less caster). tire temps will be the best judge though on camber. if it is a left turning track, for example, then you can bias the camber a little for more right side camber. Hey, have you tried using the search function? This is one of those questions that has lots of answers if you care to look. Last edited by PUR NRG; 05-01-2011 at 04:56 AM. Annie and I ended up at -0.9 up front with 0 toe and -0.7 in the rear also with 0 toe. There is indeed a bunch of info however there is no thread that allows users to list their specs and compare notes. If you see one, post a link please. Some have their settings in their garage like Dark8 and AlexCisneros. If anyone else has theirs listed please reply here. I'm also lowered about .75 inches if that has any effect on how much camber you can get. I also used a floor jack to lift on the wheels when I tightend things up after installing the coilovers. Last edited by Dark8; 10-28-2004 at 09:18 PM. So does anyone know what is the factory specification on alignment for our car?? I'm sorry but I'm a little confused. Is the one on the left for the standard suspension setup while the smaller print on the right is for the sport suspension set? And there is no difference between front and rear?? As for the camber setting, how come there are a whole set of numbers? Left column is factory acceptable variation. Far right column is the setting. 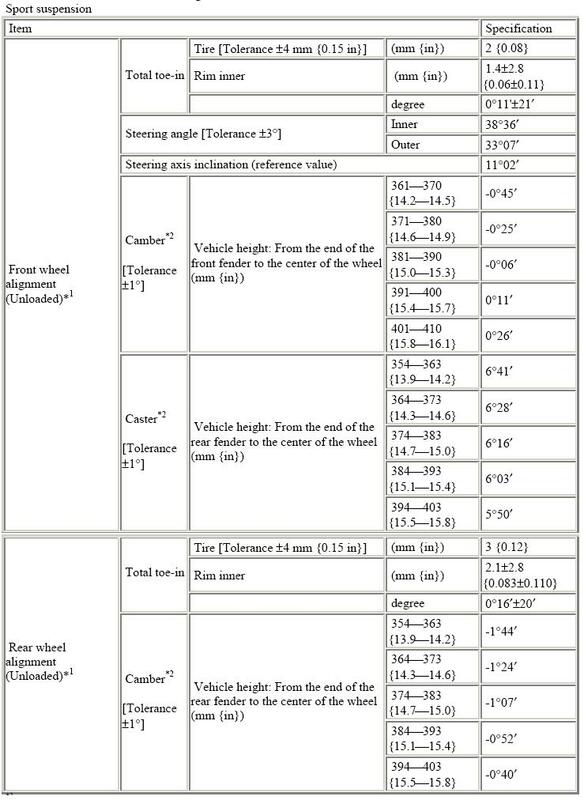 Second column from right is your vehicles ride height measured from the center of the wheel straight up to the edge of the fender. 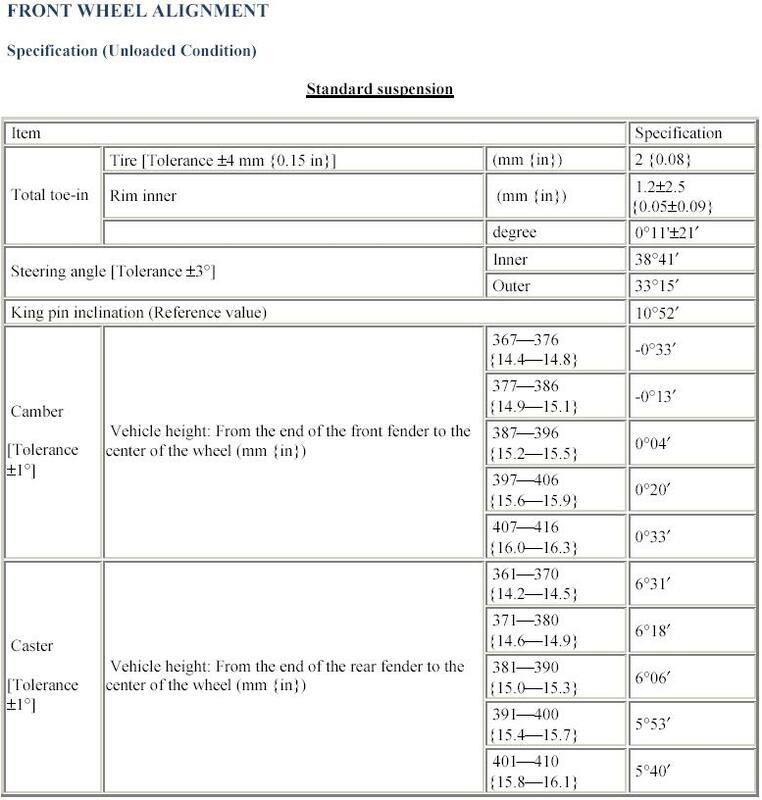 So, determin your ride height and use the numbers to the right to determine the factory setting. Hope that makes sense. That I understand. But what I'm saying is there are really two tables of settings. The table on the left is for the regular suspension while the table on the right is for the sport suspension. Since I've the sport package, I'll only follow the settings on the right table. But what seems to be missing is the Caster settings. Should I use the same one as in the table to the left which is for the regular suspension? And what about the different settings for the front versus the rear? Are these numbers applicable for both front and rear wheels?? That looks much better ;-) Btw, I realize there is no caster settings for the rear, should I use the one on the front too? One observation, in general the rear has a more pronunced -ve camber than the front according to the specification. But my impression is that most people will have a more -ve camber on the front instead when they try to set the 8 up for track use! Am I missing something or am I totally off the mark?! "Btw, I realize there is no caster settings for the rear, should I use the one on the front too?" Not sure what you mean. If you are wanting a caster setting for the rear, there isn't caster adjustments for the rear. I was running -1.4 front and -1 rear and the rear is just little too tail happy. For next season I'm going to try -1.4 rear and see if that brings it back to neutral. Keep in mind that I'm setting it up for auto-x. I definately wouldn't want a tail happy car going around a 80 mph sweeper on a race track. A little understeer can be good. My rear camber is at -1.4 so to get a bit better rotation do you think I should just get more front negative camber or go to rear toe of zero? I plan on dialing in more negative camber up front but don't want to go to extremes due to tire wear concerns. i always set my camber by looking at tire temps. even if you want to use less camber, you could still use tire temps to determine how close the front versus rear camber settings are. What's the general consensus for the front and rear camber settings for both street and occasional track use? More -ve camber on the front than it would be on the rear?? Don't pay too much attention to my alignment settings, remember I run staggered . Also I am going to be putting more positive camber in the rear to lower the traction of the rear tires and get more rotation. I just haven't gotten around to it :D .
It is a base with rear spoiler. 500 miles or something on the understeering pig. Owner(110 lbs?) sat in the car while work was happening. I sure do like seeing the "red zone" when working with the Hunter machine. Stock wheels make it tough to get alignment rig set up on. We had to tape the frame of each sensor to avoid wheel scratches and could not get an exactly even hook up to the wheel but machine supposedly compensates for the runout. Left front was the "least adjustable" and alignment was kinda based around that. Right front has lots of adjustment possible. Ended up with 1.0 neg with 6.7 caster both sides and .01 toe in a side. Playing with caster adjustment did not really increase camber. Car gains LOTS of camber as you turn the steering wheel. I mean up to almost 2 deg neg on outside wheel with just under 3/4 of a wheel turn. It also gains a little camber as front suspension is compressed and also goes slight toe out. (should help turn in under braking if you choose to do that sort of thing). Kinda cool that it does all those things. Ideal imo. 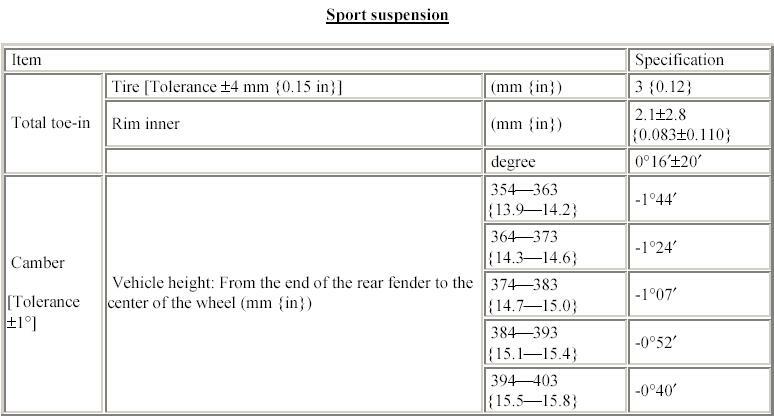 As the suspension is uncompressed(car lifted), Camber appeared to decrease ever so slightly(loses about .1 when strongly lifting the car) and toe seemed to just barely toe in. Rear ended up with 1.4 neg a side and .02 toe in a side. You can pretty much do/end up with whatever you want in the rear. Lots of camber available and lots of toe to play with. Toe adjuster is VERY sensitive to movement. A little twist of the adjuster translates into lots of toe change. Toe adjuster does not really mess with camber either. Car should be VERY easy to change at track using rear toe as one way to do it. Too much exit oversteer? just add some toe in at the rear. Got that push that you hate? just take the rear toe in out of the car but beware of too much rear toe out at the track! As the car squats on suspension in the rear, it gets a little more camber and slight toe in. I forgot what is did when we lifted it...sorry. These lift/pull down on the car does not take into effect bushing changes under power, braking or cornering but I was glad to see that all the math was going in the correct directions. On a quick recon run, it appears that the "mid corner power on excessive push/understeer" is gone. Owner should get at least 10 runs and I should get a few in this Sunday at a practice to see how fun/fast the car is. Car owner prefers tail happy over push but would prefer tail happy/oversteer coming into corner to rotate then neutral mid corner even when accelerating slightly then maybe just a hair of push right at the end of the corner under full power. We'll see..Kinda hard to do stuff on a completely stock car. Shocks/maybe a bar(not for sure yet on that)/some 710's and an exhaust should help the zoom-zoom a little bit. Our local buddie/rallyist builds high quality custom exhausts and car will be there TONIGHT. I need to make sure that car does not use back pressure to control ports like the older 7's did. I think that it is all electronic now??? Stock tires are the SP sport 8090's and appear to have some good stick. Last edited by fastmike; 11-20-2004 at 11:52 AM. Thanks for the writeup. Please follow up after your tests on a track or autocross. I am particularly interested in all the settings as I feel mine could use some minor tweaking to reduce corner exit power-on understeer. Did you find any ride height differences on the car? Any ideas how to fix a side to side ride height difference of a 1/4 inch? We are starting at a baseline setup so that we can measure how much time each mod is worth on the autox course. We were just "shooting in the dark" + a little bit of consultation with others with this first setup. I did not measure ride height or measure corner weights. Fixing things like what you describe above(ride height) is very possible but somewhat difficult to do if you want to stay legal in SCCA's solo2 Bstock class. If you do not care about legality and want to do something about your ride height diffs, just shim the stock springs or perches. The hard part is getting ahold of a corner weighting pads/box. Most race shops can set u up but make extra sure that the floor where they are doing the setup is level or that they level the pads with a super long bubble or electronic level(or other means). Be sure to ballast the seat etc. so that you are in a race ready condition. I looked at your original post in this thread and if it was my car I would first take most of your front and rear toe in out and try to fix that left front caster so that it matches the right. Remember that more caster = more camber as you turn the steering wheel. I really need to do some pyrometer testing to figure all the stuff out "for real" though on the 8. I sold my good one too! UGH! Last edited by fastmike; 11-20-2004 at 11:45 AM. 110 lbs? Male or female? And what is the "red zone"? Last edited by PUR NRG; 05-01-2011 at 04:59 AM. Hunter machine screen flashes red when you take settings out of "factory" ranges. The car needs some rear toe-in. I still do not think that the big front bar is the way to go either. I might be one of the few on that one though. I would rather size bar for long corners/turnarounds and use the shocks to tune for slaloms. That is just me though. AND some shocks ARE needed. I have a set of D/A's from my TTRX and are going to look if they will fit/work. Doubtful but worth taking a look at. Car does brake nicely if you do not use antilock too much and seems to turn in for the first 2 transitions nicely but starts to oversteer/crab sideways a little too much in the rear when power hits at top rpms while turning. Hopefully we will get it worked out. The car worked very well with some minor push, but that had more to do with the surface than anything else, as we were turning on VHT at one point. The car was very predictable, and could be made to get some good rotation at the limits. The car does still exhibit some pretty strong push in real slow turns, but as I noted earlier, this can be overcome by slowing down more. While I agree with FM that the car needs shocks, I whole-heartedly disagree with his idea of not changing the front sway bar. It tightened up the car a bunch and it still turns in very well. We'll ultimately get shocks and tune the slow speed understeer out of the car that way.